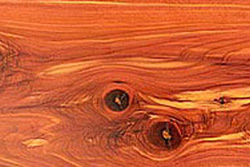 Reclaimed Cedar has white sapwood with the heartwood color of red to reddish-brown. Cedar retains its quality well and the reclaimed cedar has that extra maturity that will enrich the patina of your floor. The straight grain and tight knots combined with the contrast of the red heartwood and white sapwood make for a beautifully distinct antique floor.